External cladding plays an essential but sometimes overlooked part in providing a building with comprehensive protection from the elements. From roof cladding to external wall cladding it is always best to be fully protected and insulated, and John Dobbs Roofing have the expertise and specialist skills to assist you in delivering the necessary work and give you complete peace of mind. The location of many industrial units exposes them to the weather conditions more than traditional domestic properties. Installing wall cladding can help prolong the longevity of a building's use as well as helping with its insulation. Modern cladding does not detract from the appearance of a building, often adding an aesthetically pleasing appeal. Yet beyond the look exterior cladding panels add an additional layer of protection to the underlying building materials. This helps prevent the materials being damaged by wear and tear from the stress of varied weather conditions experienced in this country. Cladding installation plays a major part in a new build or refurbishment of a commercial unit, providing a more durable property which is not so exposed to weather elements resulting in structural problems and damp issues inside. Exterior cladding is available in a range of colours helping to transform a drab and dreary exterior, brightening up the building for your workforce and visitors alike. If you are looking for a reliable, professional cladding services company in Newcastle then we are confident you will not find a better team. 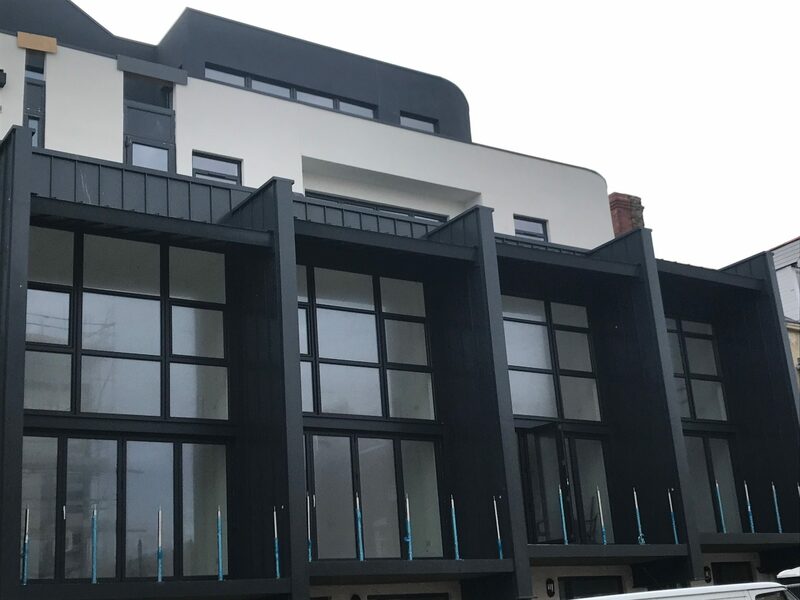 Whether you want new external wall cladding or replacement exterior cladding panels John Dobbs Roofing are cladding installers with a wealth of experience in the trade. Our friendly and helpful team can advise and guide you through all the stages with our dedicated and qualified tradesmen mindful of the need for minimal disruption to your business as they carry out the work. Options for exterior cladding when refurbishing include stripping old sheets and replacing them with new or over cladding. The benefits of both systems include improving the insulation of the building and improving the aesthetic look. Stripping sheets can be used to remove and replace old asbestos sheets. Over cladding means less disruption for your business as the existing cladding does not need to be removed allowing for the property to remain open and functional. Of the range of cladding systems we can provide, single skin cladding is one of the more widespread. This versatile method is quick to install and is often used on warehouses and storage units. Available in a selection of different colours and materials our knowledgeable advisers will work with you to tailor a system that is the best fit for your company. Alternatively you could opt for a twin skin external cladding which consists of two layers of profiled metal with insulation quilt packed between. This is a versatile system where the spacer system separating the metal layers can be adjusted to achieve the level of insulation required. Cost effective it has become widely used by cladding installers and the range of available colours also allows a degree of creativity in design. Another method to protect your valuable industrial units is by a rainscreen cladding system. Designed for weather protection it is growing in popularity in new build and refurbishment projects. Is uses a weather proof skin around ventilated cavities and uses airflow to remove any penetrating rain or moisture. Traditional methods to protect buildings from the elements have used sealants, but wear and tear over time degrades these materials allowing water and moisture to penetrate and damage the underlying materials. With a rainscreen system the moisture that penetrates is either evaporated or drains down the back of the cladding. Once installed it is low maintenance making it ideal for consideration for industrial buildings. Insulated panels offer a single component installation allowing for a faster on-site job. An easy to fit, low maintenance option they offer a superior thermal performance. A properly insulated building is a more energy efficient building, meaning lower utility costs overall and an improved carbon footprint for your company. Wall cladding panels are an excellent solution for a new build, maintenance or refurbishment project. The different methods, materials and colours allow for complete flexibility in design, giving you complete control over the final look of the outside of your commercial properties. Once installed they require low maintenance regardless of whether the material consists of metal sheeting or PVC cladding. Constructed from easy to fit but strong polyvinyl chloride, PVC cladding only needs a power wash every couple of years as maintenance. When put together the additional protection benefits, the additional insulation benefits and the aesthetically pleasing nature of wall cladding panels can add value to a commercial property. It can markedly change the look of a dreary building and is why there is such a selection of colours and materials to select from when considering exterior cladding. It is a consideration to be made that wall cladding panels can increase the value of your property if you are thinking of selling. John Dobbs can help you make the right choice of cladding systems. Our wealth of experience will help tailor a method and design that works best for the building and best for your business. We are mindful of doing everything we can to minimise disruption for your business. We appreciate that any amount of time an industrial building is not operational can be a significant loss to a business. Our advisers will work with you to come up with the best solution and work to a timescale that fits with you and your work force. We are confident that you will be more than satisfied with the work we provide, based on years of roofing and wall cladding experience. We have built up a strong reputation in the trade and hope to show you just why that is. If you are thinking of needing cladding installers in Newcastle for any of your industrial buildings then please do not hesitate to call our friendly and dedicated team now.